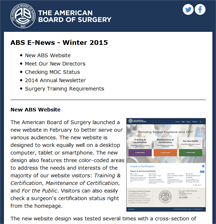 ABS E-News contains brief updates from the ABS and is sent automatically by email to current diplomates and training programs three to four times per year. Other individuals can sign up to receive it. Diplomates should make sure to keep their email address up to date (update personal information) to receive this update.